The question is then what the ceci in the example above points to: the image within the composition, or the composition as a whole. The term “JPEG” is an initialism/acronym for the Joint Photographic Experts Group, which created the standard. … JPEG files usually have a filename extension of .jpg or .jpeg. 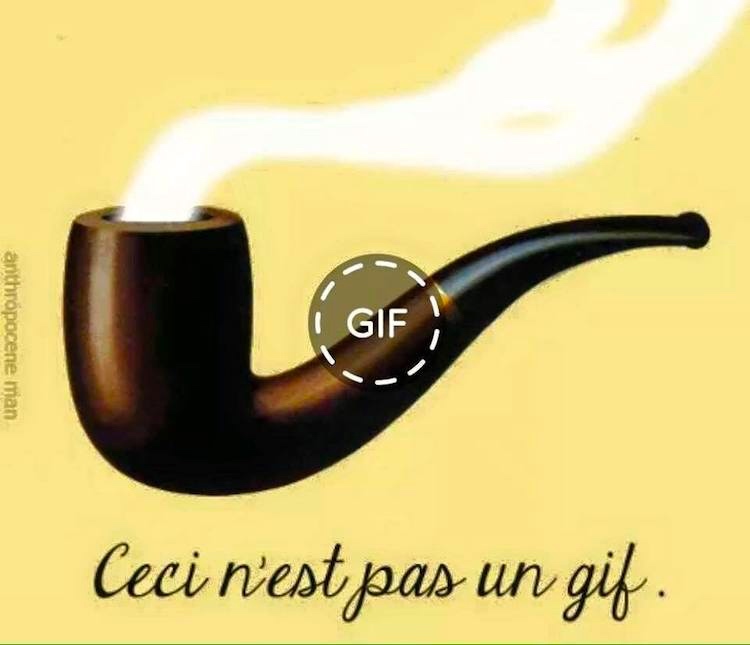 The example above has the image of a pipe, plus the GIF label. The example isn’t a format or a file, so senses (a) and (b) of GIF are inapplicable, and only sense (c) applies. But exactly what does the label apply to — just the pipe image or the whole composition? Can’t be just the pipe image, since parts of an image don’t have formats of their own. Must be the whole composition. But then the question is whether the composition above is stored as a GIF or in some other format. In fact, the composition above is stored as a .jpg file on my computer, so Ceci n’est pas un gif is simply true — on this computer, though it would be false in other installations. The point is that the composition itself has no intrinsic format, and Ceci n’est pas un gif embodies a type of category error. Now, Ceci n’est pas une image ‘This is not an image’ would be a candidate for self-referential disavowal, and we could argue over whether it’s paradoxical or simply false. But Ceci n’est pas un gif makes no testable claim at all. This entry was posted on April 2, 2018 at 4:48 am and is filed under Ambiguity, Deixis, Philosophy, Semantics. You can follow any responses to this entry through the RSS 2.0 feed. You can leave a response, or trackback from your own site. You are missing a key fact. GIF, unlike JPEG, supports animation; a single GIF file can contain multiple images. Because obviously these are large, some platforms (particularly Tumblr) mark them with the kind of circle in the middle shown here. When you click on them they download the rest of the frames and animate. This is specifically not an animated GIF but a flat image with the icon as part of it.